Another historical interpreter once told me that “love is in the details.” The expression struck a chord with me, and from then on, when it comes to interpreting history, I have believed that paying strong attention to detail is what turns good work into great work. In my own process, for example, I always try to pay careful attention to the details of language. In Barkerville, I play a documented character that lived and worked on Williams Creek from 1864 until 1875. Our mandate for street interpretation is to address the town’s entire history – from 1862 until 2014 – so I must therefore be able to speak about events that happened outside of the timeframe defined by my role. Like many of us at the site, I converse with careful attention paid to the use of the past, present and future tense. In Barkerville you may hear me say something like “in 1958, the town will transition from a fully functional municipality into a heritage site, or living-history museum.” By using the future tense (‘will transition’) rather than saying ‘did transition’ or ‘transitioned,’ I remain authentically in role while simultaneously acknowledging the inauthenticity of the situation: my historical character, in her actual life, obviously could not have known what would happen to Barkerville almost 100 years after she died. When Barkerville’s street interpreters speak about modern concepts within the confines of this ‘omniscient’ character concept, we are not re-enacting. We are acting. We are being authentically inauthentic. It’s the details that make it work. Whether I am on the street, inside a building, or frequenting a business in Barkerville, I always maintain historically authentic dialect, turns of phrase, and mannerisms. We take pride in the finer details of our antique appearance – proper hairstyles, accessories and attire are essential to presenting first-person educational programs at our National Historic Site. Female interpreters wear gloves and hats when outdoors, for example, and male interpreters remove their hats when entering a building. For Barkerville interpreters, careful observance of historical details reveals our respect for the site, our audience, and the history we share – but we’re not the only ones who obsess over those small but crucial elements that make a visit to the site unique. Many of our merchants take great pains to obscure necessary modern conveniences like power outlets, credit card machines, and commercial cooking equipment. They also carefully select merchandise and wares that fit our bygone story. Food and beverage providers pay attention to menu items that both meet visitor expectations and reflect our exceptional historical setting. Our Curatorial and Visitor Experiences teams are constantly attending to a myriad of details that provide guests the opportunity to feel connected to another time. Be it garbage cans encased in wooden barrels or modern fire hydrants concealed by realistic facades, we try to eliminate anything anachronistic that may jar your eye. These details might not occur to you when you visit Barkerville, but they quietly impact your experience. Our presentation isn’t perfect. Of course it’s not. There are many areas where attention to detail can be enriched, and we are always trying to improve. This is true of any heritage site and part of the excitement and challenge of working at a living history museum as large and as complex as Barkerville comes from understanding that our job is, and always will be, a passionate work in progress. 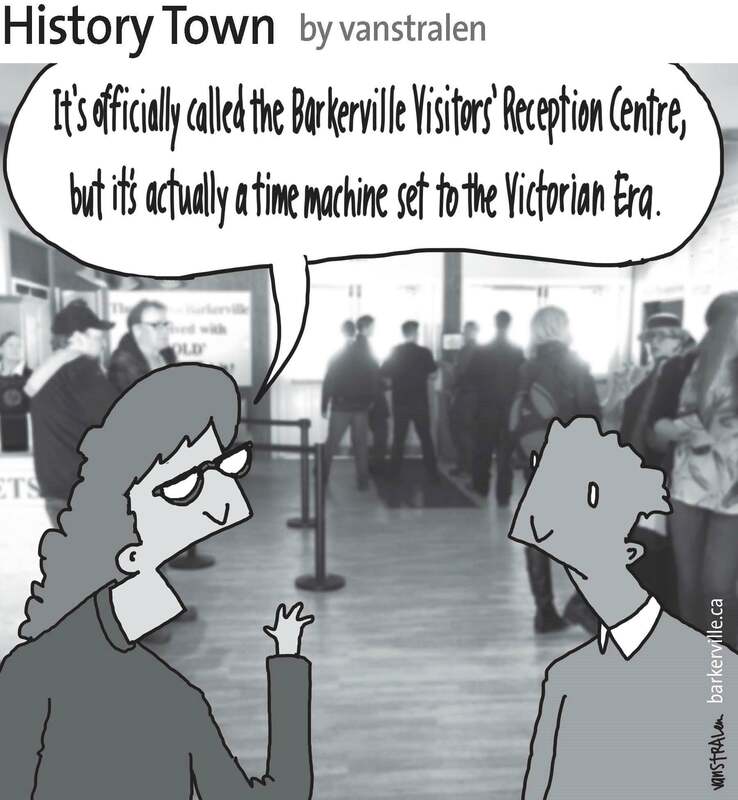 The above one-panel cartoon (originally published June 10, 2014) by Dirk Van Stralen, with accompanying editorial by Danette Boucher, is the fourth of twenty weekly entries that were logged – and subsequently blogged – as part of a 2014 collaboration between Barkerville, British Columbia and the Prince George Citizen aimed at introducing some of the quirkier advantages to living, working, and playing in the Cariboo Goldfields. We hope you enjoy!